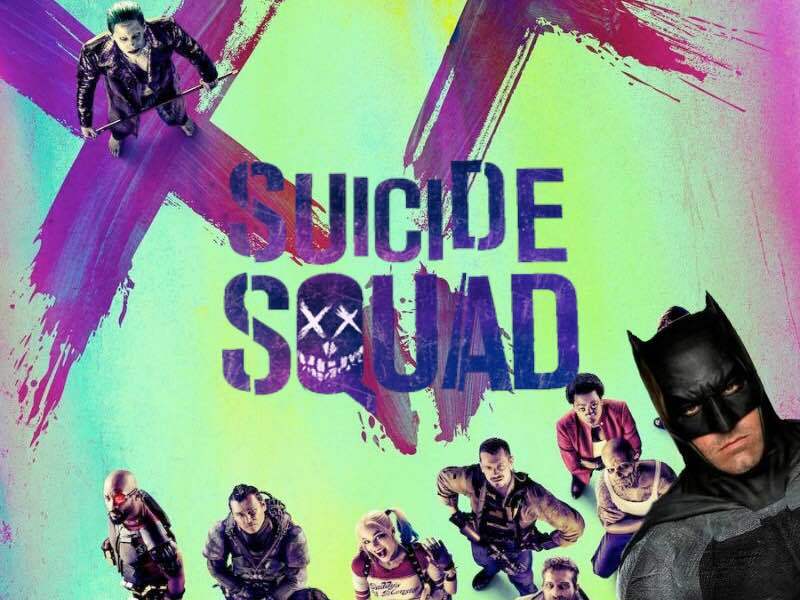 This report features some *potential spoilers* for Suicide Squad. With David Ayer’s Suicide Squad coming out later this summer, excitement for the DCEU’s first movie post-Batman v Superman has only risen. There have been three great trailers released for the film, each having a brilliant song choice representing Ayer’s tone for these eccentric DC villains. Also, Early reactions from a recent test screening have emerged, and the reception has been positive, which adds some much-needed goodwill for DC after Batman v Superman’s mixed-to-negative response from critics and audiences alike. One of the aspects that fans are most excited to see is a cameo from Ben Affleck’s Batman – who seems to be one of the few elements in Zack Snyder’s film that critics and audiences collectively agree is fantastic. Batman News is reporting that the caped crusader will share interactions with certain characters in the upcoming film. According to the report, Batman does not come across the entire team in the film, but he does have a scene with Deadshot (Will Smith). The source does not get into any specifics, but claims that the scene between these two is an emotional one. Also, in one of the most prominent scenes found in the trailers, there is a car scene that features the Joker (Jared Leto) and Harley Quinn (Margot Robbie) inside the vehicle – with Batman on top of it. Unfortunately, the Joker and Batman don’t share much interaction with each other, for most of the interaction is between Batman and Harley. If you can piece together information from the trailers, the car apparently plunges into the water, and Batman saves Harley in the process. I must admit, I am a bit disappointed that there may be less interaction between Batman and the Joker, but perhaps that can wait until Affleck’s standalone movie. What do you guys think of these potential interactions Batfleck shares with these characters? Sound off in the comments below. Suicide Squad hits theaters on August 5. Sorry, but Suicide Squad comics has just a few appearance of classic heroes. Actually, like a fan of the comics, I hope that the focus be in the members of the Squad, like Harley (yes, Harley again! ), Deadshot, Rick Flag and Boomerang. I hope the Joker be the villain too! Agreed. Batman only needs a cameo for this film. If he’s not the focus, then he shouldn’t be more than that. DC needs to wean itself off of Batman, they need to build other characters. I dont want a situation where Batman is in every single DCEU film. A Superman cameo would be nice, or an obscure character like Vixen, Lobo or Shazam! Well, I dunno about weaning themselves off Batman. Kinda hard to do, when A) he’s arguably THE most popular character in comics, & B) they named the company after the book he’s in. It would kinda be like Marvel (& yes, forgive the comparison) weaning off of Iron Man. He’s the one that brought them to the dance. If you notice, it’s only the films that he appears in, that are the top grosses. But I do agree with your point, that more DC characters need to shine in the light. I’m hoping WW becomes one of those people. i really think Shazam can be a huge hit for the kid-friendly crowd, Wonder Woman can bring in the women and Lobo can bring in the R-rated over the top demo. Superman will always be an icon, he’s almost a god to us at this point. Guardians of the galaxy begs to differ. Begs to differ, about what? thing is they cant shine cause noone out side of avid fans cares about dc other then batman. batman is a brand bigger then the company dc it self. ww film is going to flop . a marvel film coming out before and after he release date along with depps pirates and tom cruises mummy coming out before and after lmao. ww is going to flop hard in the boxoffice. there is no such thing as other dc characters shining. cause noone cars about dc other then batman ..
dc has made whats about 27 films .. only 10 films have exceeded expectations 7 batman films and 3 superman films lmao ..
“my room mate Lori Is getting paid on the internet $98/hr”…..!te845urtwo days ago grey MacLaren. P1 I bought after earning 18,512 Dollars..it was my previous month’s payout..just a little over.17k Dollars Last month..3-5 hours job a day…with weekly payouts..it’s realy the simplest. job I have ever Do.. I Joined This 7 months. ago. and now making over hourly. 87 Dollars…Learn. More right Here !te845u:➽:➽:.➽.➽.➽.➽ http://GlobalSuperJobsReportsEmploymentsProductionGetPay-Hour$98…. .★★★★★★★★★★★★★★★★★★★★★★★★★★★★★★★★★★★★★★★★★★★★★★★★★★★★::::::!te845u….,.. Deadshot’s mother’s name was Geneveive. Oh ok so Batman won’t become best friends with him. Well, it could be worse…. Deadshot coulda been friends with the guy who killed Batman’s mom, and he coulda known about it the whole time. No, nothing is worse than that stupid scene. Also, who refers to their mom by her first name? Yeah, because letting someone who is your “best friend” get away with killing your other “friend’s” parents, is no where near as bad as the moms of two guys fighting having the same name. Got it. No bias there. Have a great day!! See that’s what makes it interesting plus it’s not black and white. Bucky wasn’t in control of his actions, so it adds wrinkles to the plot. It’s not dumb that their mothers have the same name. It’s dumb that one refers to their mother by their first name and that that fact alone makes you stop fighting. What if Lex’s mother’s name was Martha, would superman ally himself with him instead? All you’re demonstrating here, is your bias. You’ll go to the greatest lengths to see the flaws in one scenario, but just the opposite form the other. No, it’s dumb. Scores of people got hurt/killed, because of Bucky’s actions, & Cap was barely sympathetic (let alone empathetic) to the repercussions of his “friend’s” far reaching actions. And I’m not just talking in the past, I’m talking in the moment of the film. It was just one bad decision after another, & he never once took any real time to reflect on his own actions. He never once considered that the needs of the many are supposed to outweigh the needs of the few. But thru the entire film, he was practically in dereliction of duty, all form the whims of his Bro-mantic partner. And the “he’s my friend” logic is just as bad (worse, actually) as/than the “Martha” issue. The ramifications of CW are far greater than Batman not killing Superman because they share their mothers’ name. It’s not dumb that their mothers have the same name. It’s dumb that one refers to their mother by their first name and that that fact alone makes you stop fighting. 1) People refer to their parent by their names all the time. To total stranger: “Hi, I’m looking for mom” vs “Hi, I’m looking for Denise”. People only usually refer to their mom as “mom” to other family members. 2) If you were paying attention to the film, that wasn’t the only thing that got them to stop fighting. I’ll leave it to you, to watch the film again, to figure out what it was. What if Lex’s mother’s name was Martha, would superman ally himself with him instead? Do you not hear how dumb this question is? Why on earth would he have allied himself with the guy who kidnapped his mother, regardless of what their respective mothers’ names were? Who was killed by Bucky since he came out of the brainwashing? Also, Bruce has no idea who Martha Kent is, Lois has to explain it to him, so saying “Martha” isn’t like going to your mother’s job and asking can I speak to Martha. For the name to have relevance the other party needs to know them. Don’t think I didn’t notice how you ducked my more germane points, in favor of focusing on the less germane one. That’s why I said “hurt/killed” in my initial response. But I’m sure you noticed that as well. Anyways, that entire car cha scene was completely reckless on the part of all 3 characters (Cap, Bucky, & BP). It’s funny, how people lamented over the manslaughter of Batman in his Batmobile (even though that was with criminals who were shooting machine gun & bazookas at him), but saw no problems with cars flipping over with innocent bystanders, where NEVER ONCE stopped to help anybody, while he was chasing after his boyfriend Bucky. Not to mention, both Cap & Bucky are fighting “normal” police & soldiers, in such a manner that they are breaking their arms, cracking their ribs, etc. But hey, I guess that’s all justified, never mind the fact that Cap is supposed to be on the same side as these Civil servants, all of whom get paid by the same people he gets paid by, for simply doing their job. I can see that you (& perhaps all the other Zombies) are trying to perform all sorts of mental acrobatics, in order for CW’s nonsense to make sense to you. And trust me, I haven’t even started in on that movie. I have easily a dozen different plot holes that I’ve seen (there are probably a few more that I missed), but I’m much more content to stick with this one plot hole, that I’m watching you struggle to reconcile. And you just keep reaching way past the point, in order to justify your contempt for the Martha scenario, don’t you? I can go to a place & find someone named “Martha”; I can NEVER do that for someone named “Mom”. And it wasn’t the point, of whether Bruce knew Clark’s “Martha” was. We’d already seen Clark call Bruce by his first name, at the beginning of the fight.. We also know Bruce was smart enough to realize that Superman would have done his research on Batman. How difficult would it have been for Bruce to go to the place of realizing that Clark figured out that Bruce’s parents were murdered? It’s not like it’s not public record. Jeez don’t you have work to do? I don’t really need to prove or defend anything since the numbers and reviews are what they are. Billon dollars and great reviews. The things you are pointing out are character flaws, which if you were sick that day of screenwriting 101, make for nuanced characters. No one is killed by Bucky’s/Cap’s/BP’s actions. In the real world there are these things called “friends” and usually if you’re not a scumbag, you give your friends the benefit of the doubt. After a lifetime of self sacrifice Cap “indulged” in a personal want. Which wasn’t really that selfish, his friend was believed innocent and there were shoot to kill orders on him. Cap is caught in the middle of trying to protect his best friend from being killed on site. Question, do you like anything outside of DC and if so what? And there it is. Thank you for proving my point. It doesn’t matter how dumb CW was, because more people liked it. You’re speaking volumes right now, probably without even realizing it. You can’t even bring yourself to actually consider any of the points I made. Let alone any of the other flaws that the film clearly has. You’re ready to talk them down, & talk up how many money this film made, as if that’s even remotely germane to THIS discussion. You sound desperate, dishonest, & defeated by even mentioning that. Which is why you have ZERO credibility, in terms of trying to vilify what DC does. As for what I like outside of DC, there’s plenty. I like Star Trek, for example. Oh, so you love sinking ships. As opposed to, what….. pointless, deathless, popcorn, juvenile media? And ST has a new film coming, along with a new TV show. What’s happening with Marvel’s TV content, BTW? Or that’s right: one show got cancelled, one show is getting put out to pasture, & one show was shot in the head before it even got off the ground. So save your backhanded, hypocritical insults. I like what I like, as apparently you do too. Haha you get so testy so easily. You’re a troll but a very amusing one to mess with. You get so heated and write these diatribes about inferior products, it’s fun. Yeah, that other idiot on here tried that same argument with me, & ended up getting his &$$ handed to him as well. You’re not rustling my Jimmies, not in the slightest. I’m so calm & relaxed as I post my responses, it’s not even funny. I’m far more verbose than most of you pedestrian-minded DC trolls that come in here, that it’s not even funny. Except form the fact that it is. But I’m glad you’re finding entertainment from all this. But what you fail to realize, is that I’m entertained s well…. It brings me great levels of joy brow beating you &$$-hats to death, while exposing your ignorance in the process, & watch you wriggle like little fishes on my hook. Neither you, nor any of my other detractors that sign in for the sole purpose of seeing what I’ve written, are on my level. So good luck with sitting there myopically thinking you’ve accomplished something. I’d pity you, if I weren’t already so entertained by you. That’s a lot of paragraphs, do you know what female anatomy looks like? Oh wow, look…. Another moronic statement, of the “you’re way smarter than me, so you must not get any girls” variety. I’ll be sure to pass that along to my wife when I see her later on this evening. ? No, it’s just you write these really long and involved posts. Ahhh, so that’s the problem: now its that Im too verbose. And that, pray-tell, has…. What, to do with “seeing the female anatomy”? By all means, don’t stop making a fool of yourself. I’m thoroughly entertained. xmen currently rated better then bvs on imdb rt and metacrtic. bvs officially the worst rated superhero film of 2016. will be competing with ss for last place and 2nd worst lmao. These jokes are never funny. Just… stop. Find a new schtick. If WB plays their cards right, SS could be their Fast/Furious. I’d love to see Bronze Tiger, King Shark and Nightshade in the sequel.